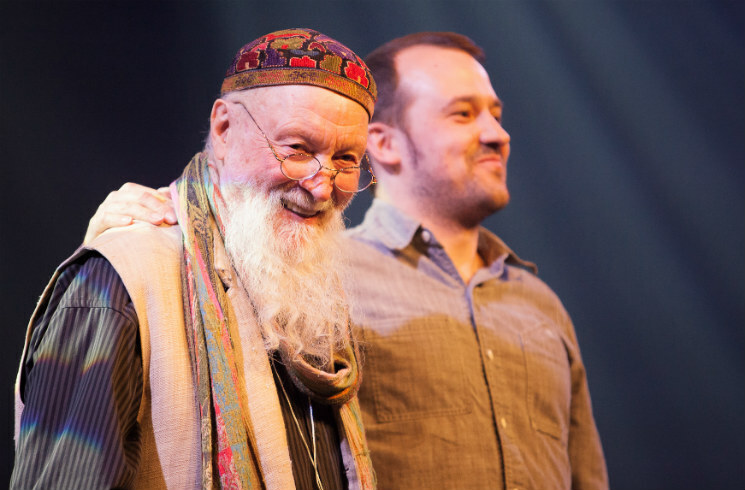 Terry Riley is one of the greatest composers of the last 100 years. His style is often called Minimalism, but earlier today (May 20), while watching some Bruce Connors films that used Riley's music as their scores, I was struck by how weak a description that is. His compositions are active, living organisms that are often teeming with notes, melodies and harmonics. Often they have structures based on repeating motifs, but minimal they are not. His Festival International de Musique Actuelle de Victoriaville set combined Terry's keyboard mastery with the electric guitar playing of his son, Gyan. The music was loose and joyous. Terry moved between a grand piano, a couple of synthesizers and a melodica and Gyan stuck to electric guitar, but at times it was so heavily effected it sounded more like some sort of cartoon noisemaker. This fit well with the dynamic. Terry mostly stayed away from his signature rounds, playing simple open melodies, although there were several sequences where both musicians drifted in a more formal direction. Surprisingly, the patterns struck me as more like Bach etudes than I'd ever noticed before. Terry also sang at a couple of points. He actually began the set with some raga singing, and later did some very estimable scatting. Casual as the concert's overall structure was, the music held together with a kind of beatific grace. One guy I talked to said he'd wished it had been more rigorously studious, but I think he's a professor — and you know what they're like.